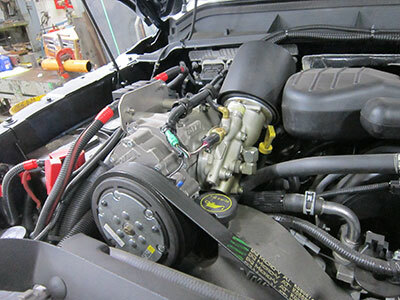 Is an UNDERHOOD™ air compressor right for your fleet? Located in Charleston, West Virginia, Mountaineer Gas Company is WV’s largest distributor of natural gas. Servicing over 220,000 customers in 49 different counties, it’s important to ensure each part of the business is operating efficiently, and that includes a careful supplier and equipment selection process. Ken Martin is Mountaineer Gas Company’s Fleet, Safety, and Risk Coordinator, who oversees the organization’s fleet of Ford F550 trucks. After working with tow behind and truck-mounted air compressors, the company made the change to UNDERHOOD™ air compressors. The change didn’t happen overnight though, Ken had to do his due diligence to overcome concerns about truck warranty issues. After learning more about UNDERHOOD™ air compressors, Ken found that OEM truck engine warranties remain intact with UNDERHOOD™ air compressors. What’s more, VMAC has shipped over 25,000 UNDERHOOD™ air compressor systems worldwide, with 60% of those being for Ford trucks. Surely over 15,000 Ford truck owners couldn’t be wrong. More research showed that the Magnusson-Moss Warranty Act provides additional warranty protection, making it illegal for companies to void warranties simply because an aftermarket part has been installed. Soon it became clear that the benefits of a UNDERHOOD™ air compressor justified the investment required to replace Mountaineer Gas Company’s existing tow behind and truck-mounted air compressors with an engine-mounted solution. Ken found the UNDERHOOD™ 150 air compressor to be small and compact, “[it] fits in the engine compartment and out of the way, [and is] able to produce a sufficient amount of CFM to operate [our] heavy duty tools.” Ken also noted that the feature he likes most about the product is that it runs off the belt system of the truck engine. After reviewing each of the benefits of VMAC air compressors, Mountaineer Gas Company made the change to outfit their Ford F550s with UNDERHOOD™ 150 air compressors. The increased investment in this equipment was well worth the improvements in safety, efficiency, reliability, convenience, and cargo space. After the installation of UNDERHOOD™ 150 air compressors on his trucks, Ken has made sure to follow the 200 and 400 hour service schedule that VMAC recommends for each air compressor. “If not properly maintained, [like anything], the VMAC air compressors will fail causing costly repairs,” says Martin. That said, he is first to admit the product is well-built. Each VMAC air compressor comes with the industry’s first Lifetime Warranty. Learn more about the UNDERHOOD™ 150 Air Compressor or give us a call at 1-888-514-6656 if you have any questions about our UNDERHOOD™ air compressor line.